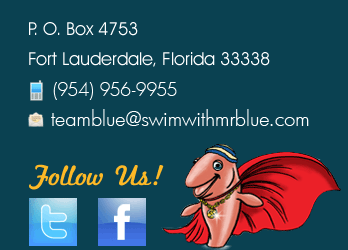 Mr. Blue and his crew are all about teaching kids to swim safely and successfully in the water. This is why they have created the Super Swimmer’s Foundation allowing them to be further dedicated to teaching all children with autism and special needs to learn to swim. As Autism advocates, Julie Gross and the Mr. Blue crew enjoy participating in community events that support advocacy for autism. Mr. Blue and his crew enjoy participation with Surfers for Autism, which provides a day focused on both parents of and kids with Autism. Mr. Blue and his crew enjoy putting on the Mr. Blue water safety puppet show at events such as this. They perform a re-enactment of their book, Learn to Swim with Mr. Blue. Mr. Blue and his swimming crew teach children how to be safe in and out of the water. With songs, colorful characters and lots of bright movements, Mr. Blue and the crew captivate the attention of children of all ages. They really enjoy the story about the day that Mr. Blue forgot how to swim. After the show, the kids are able to meet each character. 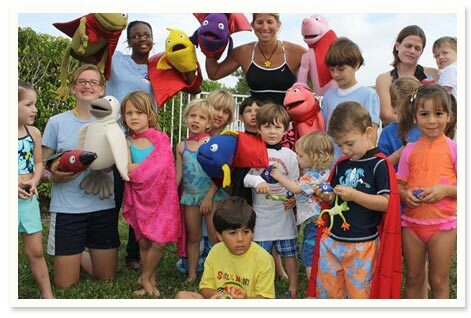 For those interested in booking an appointment for the Mr. Blue Water Safety Puppet Show call Ms. Julie at (954)-956-9955. The Surfers for Autism mission is to unlock the potential of people with developmental disabilities, support advocacy for autism issues and scientific research. Their focus is to eliminate stigma through public awareness and education and to unite communities through volunteerism. At a SFA event, their surfers are provided a safe environment where two to four highly skilled and trained surf instructors carefully guide youth into waves. This is a day dedicated to young surfers with autism and special needs and their families. They receive star treatment and are presented with a day filled with a variety of activities including stand up paddle boarding, kayaking, live music, face-painting, games, bounce houses, fire engine tours and much more. Busy surfers require sustenance so a free catered lunch is also provided to keep energy levels high. This is a very special event where children with Autism Spectrum Disorder interact with typical peers and wow families with their capabilities. For more information about advocacy for Autism, view our additional articles.